It was unfortunate that New York City’s first landfall hurricane in decades was going to occur Saturday night because Friday night’s crowd at Shea Stadium for the Woodsman/Steve Gunn show certainly had that ghostly evacuated feeling. Hell, I almost left, but with my first earthquake experience earlier in the week, I figured, why not make it two natural disasters in one week and soak up nature’s wrath as much as possible? The crowd at the show was either jacked up for the impending catastrophe or secretly fraught about the unknown. 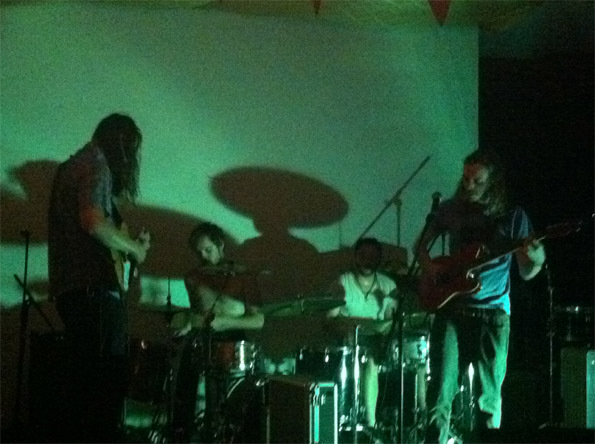 Without any boggy hesitation, Woodsman (from Denver) went into action and ended up making the most of their tour stop in Bushwick. Powered by two percussionists and two guitarists, each with shoulder-length hair that masks their identities, the Woodsman were an imposing lot. Throughout the set, each guitarist would take a turn lurching down over their effects modules in front of the stage, chanting and turning knobs, manipulating a dizzying array of chords and feedback. Their loosely coordinated guitar meanderings and penetrating twin drummers had an introspective crowd closely in tune with songs mostly drawn from their latest album, Rare Forms. In fact, it was the song “Insects” that had the majority of the crowd clamoring to look over and around each other, attempting to get a glimpse of how guitarist and lead singer, Trevor Peterson, was recording the intro guitar lick in real-time to then run on a loop while the rest of the group members surged in around him, forming the nexus of Woodsman’s incredible psychedelic sound. Although the vocals were almost non-existent for most of the show, it meant that the instrumentation had to be that much more on point, and they delivered. If only for an hour, Woodsman’s experimental, mind-altering indie rock deflected some of the media-spun doomsday predictions of death, destruction, flying debris, and boarded-up neighborhoods.